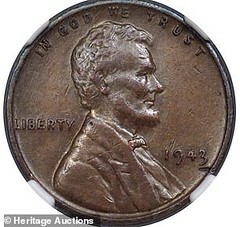 In this case, a rare penny, expected to fetch about $170,000 at auction this week, brought in a little over $200,000. The 1943 copper penny was minted in Philadelphia and is one of an estimated 10 to 15 in existence. 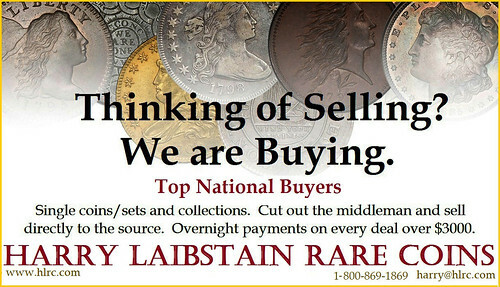 Heritage Auctions spokesman Eric Bradley tells Fortune that the coins are rare because they weren’t made of zinc-coated steel, as were others at the time. Tom Caldwell, of Concord, Mass. was the top bidder of the Philadelphia penny. He says he plans to display it at various coin shows around the country. The money raised from the sale will go to the Pittsfield Public Library, where Don Lutes, Jr., the original owner of the coin, was a patron until his death last September. 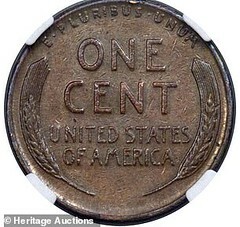 Lutes received the penny in 1947 as change for his school lunch. Intrigued, he asked the U.S. Treasury if it had made any copper pennies in 1943 and was told no. He kept the coin anyway. The only thing I ever got from my school cafeteria was heartburn. See the earlier E-Sylum articles for more background on the coin. What a great gesture to donate the proceeds to a library.